It's difficult to remember myself small enough to enjoy lunch at this tiny picnic table, but alas, back in 1975 I was. My mom would make me the most delicious peanut butter (smooth, not chunky) with grape jelly on white bread. Remember white bread? It's been years since I've enjoyed a sandwich on white bread. What I wouldn't give to close my eyes and return to the old grassy, tree-filled backyard of our Oakdale, Long Island home and sit at the tiny table above (similar to the one I had). I was never one for milk, so I probably drank a cup of juice or water with my soft peanut butter and jelly. I would sit at that table for three seasons out of the year. I think we even brought the table indoors. In the winter months, Mom and Dad would let me watch TV while enjoying dinner in the living room at my little picnic table. We had a little picnic table like that in the basement so we could snack and color while my mom was doing laundry. Our favorite snack was green peppers and my mom's homemade hummus. I ate so much of that stuff I should have looked like a chick pea! We had a table of our own, too, and it had such wonderful memories for me that I brought it to my house and my kids now build Legos on it. Such a sweet memory-maker! 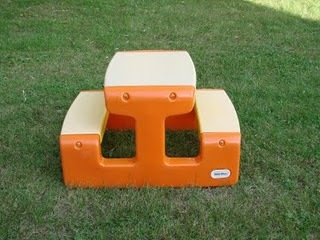 I remember a ton of people had those little tables! Ah yes. These large chunks of plastic started showing up everywhere at some point. Gee-wonder if some are contributing to landfills now? I had that too...my dad and I used to have picnics at it. Oh that picture made me smile this morning. Never had one of those tables so I can't comment to that. I do have to wonder though, am I the only person who likes chunky peanut butter? I always run into people who prefer smooth. My folks bought one of those inexpensive wood picnic tables, the kind with the splinters lol, but we used to sit out back on hot summer nights and eat or play games. I remember my brother pointing out something moving across the sky and telling me it was a satellite. Thanks for the follow. It's great to "meet" you! I love chunky peanut butter! Although obviously I did not as a child. We all know that chunky peanut butter was worse than whole wheat bread and crusts combined. We live in a condo, but we have a little picnic table on our porch for my son. We also bring it indoors during the winter. But at all other times of the year, he likes to play play-doh on it. i feel sad now that my mom never got us that picnic table. we had a normal wooden adult sized one when i was little, so i'm sure she figured we didn't need a kid-sized plastic one. my kids had a table like that. i still think pb & j sandwichs are the best sandwich ever! That's such a warmhearted story. Have taught preschool fairly recently, it's nice to have seen that these are still around. They should make them adult size too! Yep. They still have those adorable little things! I was never small enough to fit one. We used to have that picnic table too! I think they rereleased it in the '90s. I used to make forts underneath- how did I ever fit under there? White bread pssh. I still eat it and love it. Nevermind the calories.